A post about k-mers - this time for taxonomy! I love k-mers. Unlike software engineering or metagenomics, this isn't a love-hate relationship - this is a pure "gosh aren't they wonderful" kind of love and admiration. They "just work" in so many situations that it helps validate the last 10 years of my research life (which, let's be honest, has been pretty k-mer focused!). DNA k-mers underlie much of our assembly work, and we (along with many others!) have spent a lot of time thinking about how to store k-mer graphs efficiently, discard redundant data, and count them efficiently. More recently, we've been enthused about using k-mer based similarity measures and computing and searching k-mer-based sketch search databases for all the things. But I haven't spent too much talking about using k-mers for taxonomy, although that has become an ahem area of interest recently, if you read into our papers a bit. In this blog post I'm going to fix this by doing a little bit of a literature review and waxing enthusiastic about other people's work. Then in a future blog post I'll talk about how we're building off of this work in fun! and interesting? ways! K-mers are a fairly simple concept that turn out to be tremendously powerful. The important concept here is that long k-mers are species specific. We'll go into a bit more detail later. 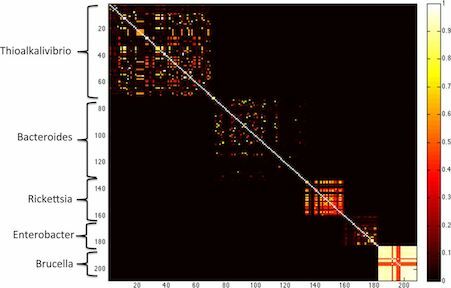 Graphs of many k-mers together are called De Bruijn graphs, and assemblers like MEGAHIT and SOAPdenovo are De Bruijn graph assemblers - they use k-mers underneath. Why k-mers, though? Why not just work with the full read sequences? Computers love k-mers because there's no ambiguity in matching them. You either have an exact match, or you don't. And computers love that sort of thing! Basically, it's really easy for a computer to tell if two reads share a k-mer, and it's pretty easy for a computer to store all the k-mers that it sees in a pile of reads or in a genome. So! On to some papers! About a year and a half ago, I had the pleasure of reviewing the MetaPalette paper by David Koslicki and Daniel Falush. This paper did some really cool things and I'm going to focus on two of the least cool things (the cooler things are deeper and worth exploring, but mathematical enough that I haven't fully understood them). The first cool thing: the authors show that k-mer similarity between genomes at different k approximates various degrees of taxonomic similarity. Roughly, high similarity at k=21 defines genus-level similarity, k=31 defines species-level, and k=51 defines strain-level. (This is an ad-lib from what is much more precisely and carefully stated within the paper.) This relationship is something that we already sorta knew from Kraken and similar k-mer-based taxonomic efforts, but the MetaPalette paper was the first paper I remember reading where the specifics really stuck to me. This figure, taken from the MetaPalette paper, shows clearly how overall k-mer similarity between pairs of genomes matches the overall structure of genera. 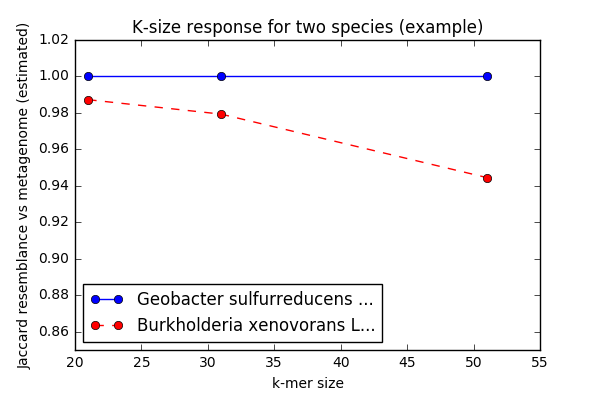 In this figure (generated by code from our metagenome assembly preprint), you can see that this specific Geobacter genome's inclusion in the metagenome stays the same as we increase the k-mer size, while Burkholderia's decreases. This suggests that we know precisely which Geobacter is present, while only a strain variant of that Burkholderia is present. I'm not sure whether this idea has been so clearly explicated before MetaPalette - it may not be novel because it sort of falls out of De Bruijn/assembly graph concepts, for example - but again it was really nicely explained in the paper, and the paper did an excellent job of then using these two observations to build a strain-aware taxonomic classification approach for metagenomic data sets. The two major drawbacks of MetaPalette were that the implementation (though competitive with other implementations) was quite heavyweight and couldn't run on e.g. my laptop; and the math was complicated enough that reimplementing it myself was not straightforward. The mash paper showed how a simple technique for fast comparison of sets, called MinHash - published in 1998 by Broder - could be applied to sets of k-mers. The specific uses were things like comparing two genomes, or two metagenomes. The mash authors also linked the Jaccard set similarity measure to the better known (in genomics) measure, the Average Nucleotide Identity between two samples. The one big drawback of mash/MinHash for me stems from its strength: MinHash has limited resolution when comparing two sets of very different sizes, e.g. a genome and a metagenome. The standard MinHash approach assumes that the sets to be compared are of similar sizes, and that you are calculating Jaccard similarity across the entire set; in return for these assumptions, you get a fixed-size sketch with guarantees on memory usage and execution time for both preparation and comparisons. However, these assumptions prevent something I want to do very much, which is to compare complex environmental metagenomes with potential constituent genomes. 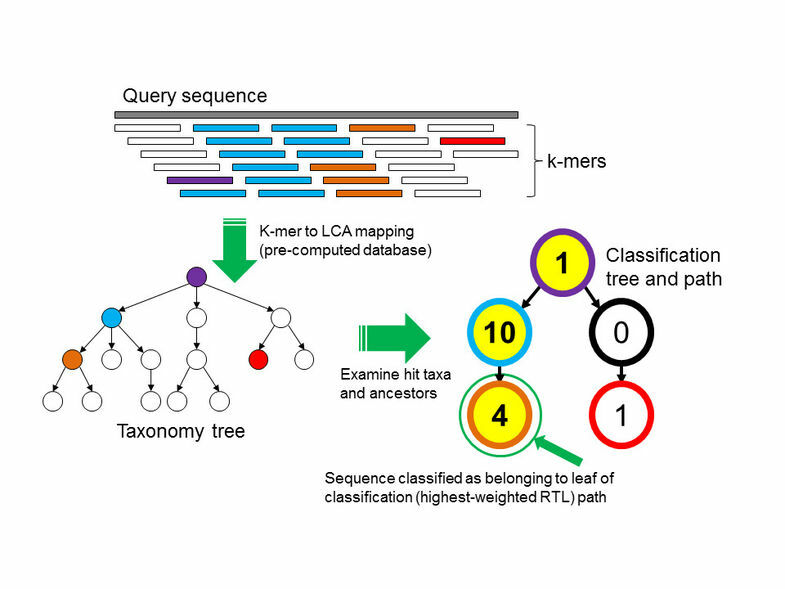 The third paper I wanted to talk about is Kraken, a metagenome taxonomic classifier by Wood and Salzberg (2014) - see manual, and paper. This is actually a somewhat older paper, and the reason I dug back into the literature is that there has been somewhat of a renaissance in k-mer classification systems as the CS crowd has discovered that storing and searching large collections of k-mers is an interesting challenge. More specifically, I've recently reviewed several papers that implement variations on the Kraken approach (most recently MetaOthello, by Liu et al (2017)). My lab has also been getting more and more office hour requests from people who want to use Kraken and Kaiju for metagenomic classification. Briefly, Kraken uses k-mers to apply the least-common-ancestor approach to taxonomic classification. The Kraken database is built by linking every known k-mer to a taxonomic ID. In cases where a k-mer belongs to only a single known genome, the assignment is easy: that k-mer gets the taxonomic ID of its parent genome. In the fairly common case that a k-mer belongs to multiple genomes, you assign the taxonomic ID of the least-common-ancestor taxonomic level to that k-mer. Then, once you have built the database, you classify sequences by looking at the taxonomic IDs of constitutent k-mers. Conveniently this step is blazingly fast! This figure (from Wood and Salzberg, 2014) shows the process that Kraken uses to do taxonomic identification. It's fast because (once you've computed the k-mer-to-LCA mapping) k-mer looks up are super fast, albeit rather memory intensive. What you end up with (when using Kraken) is a taxonomic ID for each read, which can then be post-processed with something like Bracken (Lu et al., 2017) to give you an estimated species abundance. The drawback to Kraken (and many similar approaches) is shared by MetaPalette: the databases are large, and building the databases is time/CPU-intensive. In our experience we're seeing what the manual says: you need 30+ GB RAM to run the software, and many more to build the databases. There are a number of challenges that are poorly addressed by current k-mer based classification schemes. One is scalability of classification: I really want to be able to run this stuff on my laptop! Another is scalability of the database build step: I'm OK with running that on bigger hardware than my laptop, but I want to be able to update, recombine, and customize the databases. Here, large RAM requirements are a big problem, and the tooling for database building is rather frustrating as well - more on that below. I also very much want a library implementation of these things - specifically, a library in Python. Basically, you lose a lot when you communicate between programs through files. (See this blog post for the more general argument.) This would let us intermix k-mer classification with other neat techniques. and probably some other things I'm not thinking of. The ecosystem aspect here is increasingly important and something I've been increasingly focusing on: approaches that don't work together well are simply not that useful. Another goal we are going to need to address is classification and characterization of unknowns in metagenomic studies. We are making decent progress in certain areas (metagenome-resolved genomics!!) but there are disturbing hints that we largely acting like drunks looking for their keys under the streetlight. I believe that we remain in need of systematic, scalable, comprehensive approaches for characterizing environmental metagenome data sets. This means that we will need to be thinking more and more about reference independent analyses. Of the three above papers, only mash is reference independent; MetaPalette and Kraken both rely on reference databases. Of course, those two tools address the flip side of the coin, which is to properly make use of the reference databases we do have for pre-screening and cross-validation.